- Hey you! Yes, you… with the closet full of craft supplies and unfinished projects. I need to tell you something: It's okay to have a well-stocked stash of stitching supplies on hand. In fact, it's not just okay, it's vitally important! What if you need to whip up a last-minute gift for a friend? What if there's a snow storm, and you can't get to the craft store? What if they stop making those beads in the perfect shade of sky blue? Better have a few extras on hand! 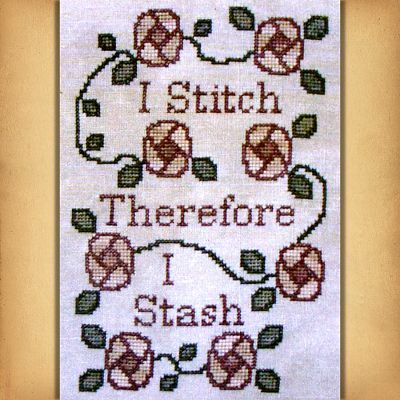 You see, I have a theory about craft supplies in general, and cross stitch supplies in particular. They are like fine wine. They need to age properly before you use them. So, you aren't hoarding. You are carefully tending to your collection as it matures. Now, practice until you can say that with a straight face! 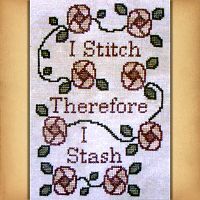 In the meantime, here's one more irresistible project for you to add to your inventory: "I Stitch Therefore I Stash". This is a pattern for counted cross stitch. You will need to supply your own fabric and floss. The design measures 72 stitches wide and 113 stitches tall. Is this an easy pattern to do? This is a wonderful pattern for an advanced beginner. With a limited palette of colors, and no fancy knots or backstitching, it makes a beautiful finished project without being too intimidating. The entire pattern is printed on a single sheet. No need to puzzle over how pages fit together. And it's a great opportunity to play with variegated floss. This is not a kit. This is just the cross stitch pattern. You will need to provide your own fabric and floss. Is this pattern available as a download? Nope, sorry. Because of the agreements we have with our suppliers, we sell physical patterns only. No digital downloads. 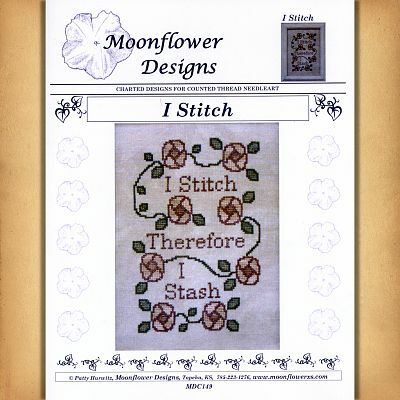 Do you have any other questions about our Stitch and Stash Cross Stitch Pattern?